The episodes starts out as I expected with Milton being beaten by the Governor and forced to choose between himself or Andrea. He takes a weak attempt at the Governor which leaves him dead in the same room as Andrea. The Governor remarks as he leaves the room with a dying Milton with Andrea, ""In this life now, you kill or you die, or you die and you kill." The Governor and his men literally storms the prison, but with the aptly named title "Welcome to the Tombs", Rick and his men are able to drive them away. Carl along with Hershel and others are hiding in the forest as this all goes down. One of the Governor's young men retreating runs across Carl and Hershel who orders him to drop his weapon. As he preparing to hand Carl his weapon, Carl shoots him in cold blood much to the dismay of Hershel. When the Governor tries to get his people to regroup to attack the prison again, they wanted none of it. That's when he shows his true colors gunning them all save one who is lucky to be lying under another and plays dead. Hershel tells Rick about what happened and he talks to Carl. Carl in one of the best scenes of the show schools Rick, that because he didn't kill the walker, it killed Dale, that because Rick didn't kill the Governor, he killed Merle. Base on this logic he had to kill the potential threat of that boy. Future Governor in the making? Rick with Daryl and Michonne goes after the Governor and his men and comes across and saves the survivor from her fellow Woodbury friends now zombies. Together they head to Woodbury where Tyrese and his sister lets them in. There they find a bitten Andrea, which totally shocks me, considering that she is still alive and well within the comic book. 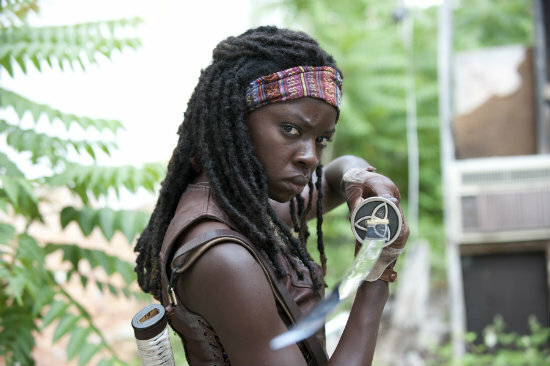 With her senses intact she takes her own life while being comforted by Michonne. This is so different from the comic book in that she never has that relationship with the Governor for which her character is hated for on the TV series. And as I said she's still alive and well in the comic book and also has a romantic relationship with Rick currently. The show ends with the remaining Woodbury residents along with Tyrese and his sister joining the prison group at the prison. Overall, I enjoyed this episode as well as the entire season. There are a lot of action and intense moments as you would hope for in a finale. The only thing I didn't like was that the Governor and his two henchmen are still at large leaving this story arc to drag on a bit longer that I would expect. Now we have to wait til October for Season 4. If you're interested in meeting some of the stars of the show, Wizard World comic convention in Philadelphia (5/30 - 6/2) will have the characters Shane, Daryl and Merle making appearances. And in New York (6/28 - 6/30) the characters Shane, Daryl, Merle and Andrea will be making appearances. Autographs and Photo Ops with the stars will incur a fee in addition to admission to the convention. The last few years the majority of the Walking Dead cast has been making appearances at New York Comic Con (10/10 - 10/13) with a panel and cast signing for free with paid admission. But the lines for the free autographs are insane. Did you like the Season 3 finale? What are your predictions for Season 4?